Some people simply will not even consider nonstick cookware. If you're one of those folks, or if you just prefer to cook like the professionals do, you'll want to explore your stainless steel cookware options. For cookware with a natural stick-resistant surface -- assuming you have the patience for seasoning it, and the muscles for wrangling it -- cast iron cookware is also a great choice. However, most home cooks prefer the convenience of nonstick pans because they make it easier to prepare food, especially delicate items that tend to fall apart like eggs or fish, and then to clean up the mess afterward. The main drawback with nonstick cookware is that the coating will scratch or otherwise wear off over time. And it doesn't seem to matter what price point you choose -- in general, nonstick pans simply don't hold up very well. That's why we recommend buying an inexpensive set and just replacing it when the pans start to scratch. In that vein, we found the best reviews overall for the Paula Deen Nonstick 15-Piece Porcelain Cookware Set (Est. $100). It's included in the a large Good Housekeeping roundup, where editors note that it browns food well and is extremely nonstick even if you don't use butter. Some owners say it seems a bit flimsy, although plenty of others comment that one thing they like about these pans is that they are so lightweight and don't require much muscle to lift and move around. This set includes a 1-quart covered saucepan, 2-quart covered saucepan, 6-quart covered stockpot, 2.75-quart covered sauté pan, 8-inch skillet, 10-inch skillet and five measuring spoons. One notable feature about the Paula Deen Cookware set is its very attractive appearance. It comes in four "crackle" finish colors (at the time of this report; discontinued colors are still widely available) and owners love having a cookware set that's so easy on the eyes. However, while beauty is sometimes only skin deep, those who may have bought these for their good looks are typically pleased to find so much substance behind the style -- the set earns almost universal praise for great cooking performance and easy clean up. Some complain that the coating scratches or begins to wear after a relatively short period of time -- and we saw some comments that the pots warped after being used at higher heats -- but most say they hold up well with proper usage and hand washing (they're dishwasher safe, but, as we've noted throughout this report, we recommend hand washing all cookware). And, to be fair, nonstick cookware should not be used at heats above medium to medium high, and all nonstick pans will eventually scratch, even with proper care. 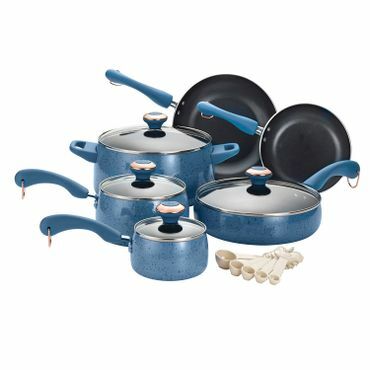 Although it's a little pricier, the Rachael Ray Cucina Hard Porcelain Enamel Nonstick Cookware Set, 12-Piece (Est. $115) gets ratings that equal those of the Paula Deen cookware set, and comes in a few more colors, six as of this update. It's also included in that same Good Housekeeping roundup, with editors there saying that it, "seared steaks to evenly browned perfection." They also highlight how easy this cookware is to use and care for. Owners agree, saying they love how Rachael Ray cookware performs, and how extremely nonstick it is. The attractive finish gets a lot of shout-outs too. A few say the pans are on the small side, but most agree that it's a fairly good selection for most families. The Rachael Ray Cucina cookware set includes 1-, 3- and 6-quart covered sauce pans, 8.5- and 10-inch skillets, a 3-quart covered sauté pan and a slotted spoon and food turner. The pans are oven safe to 400 degrees, and the manufacturer recommends hand washing only. This cookware is not induction compatible. Another cookware set that gets a lot of love from consumer reviewers is the T-Fal C112sc74 Signature Nonstick 12-Piece Cookware Set (Est. $65). In spite of its bargain basement price it get very high ratings from thousands of owners across various retail sites, who say they are surprisingly solid, sturdy pans. The lids are reported as well-fitting (an important consideration for less-expensive sets as slightly out-of-round pots are not unusual). America's Test Kitchen recommended one of the pans in this set in a 2014 episode, several reviewers note, and they purchased them on that recommendation. There are a few complaints of warping, scratching, and other quality issues, but most agree that it's an incredible value for the price. It's nice-looking too, reviewers say, and comes in black, blue or red. If you're looking for something a bit more upscale and a bit sturdier, the Anolon Advanced Bronze Collection 11-piece Set (Est. $300) did very well in the same test at Good Housekeeping that the Paula Deen and Rachael Ray cookware were featured in. There, editors say, the Anolon collection, "distributed heat perfectly evenly, maintained a steady simmer, and released scrambled eggs (made sans oil) with ease in our testing." The Anolon Advanced Bronze cookware set also gets good user reviews for durability. We found very few complaints about the interior coating scratching or peeling from users, who also rave about the superior nonstick properties, easy cleanup and stylish looks. The bronze outer coating is universally loved by owners, who say it's one of the most attractive cookware sets they've ever seen. The set includes 1.5- and 3-quart covered saucepans, an 8-quart covered stockpot, 8-inch and 10-inch skillets, a 3-quart covered sauté pan and 12-inch shallow grill pan. The pans are oven safe to 400 degrees and are not dishwasher safe. For nonstick cookware, a surface that is truly nonstick.